In the midst of drivers selflessly offering each other parking spaces, cars gliding under the 15 mph speed limit, student’s seamlessly entering and exiting campus off Haggerty, the commute around Schoolcraft is perfect­—so long as one is visiting on the weekend. For the other days of the week, results may vary. Transportation to class may be as simple as a straight shot to a front row parking space, or it may be a feat of driving dexterity, winning the face-off against competing cars for the last spot in sight. This causes not only annoyance, but danger to students and staff. Especially in the winter, the peak concern for most is entering and exiting off of Haggerty. If that route is congested, it can slow travel to-and-from campus to a crawl. In order to address transit concerns, Schoolcraft administrators have authorized a project that will tremendously benefit campus travel. A new “ring road” will soon circle behind the campus presenting additional pathways for travel, and also providing hundreds of parking spaces. 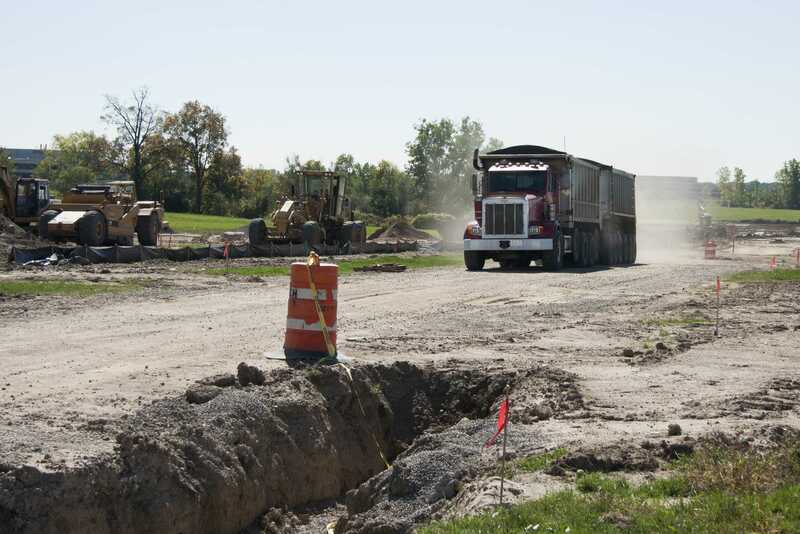 A semi-trailer truck hauling debris down the future site of the new road connection 7 Mile Road to 6 Mile Road. This will allow vehicles to travel around campus instead of through campus, keeping pedestrians safe. Photo by Lindsey Wells. Paired with this first phase is the construction of a new student lot. “We will put 350 all-new parking spaces behind the Bio-Medical Technology Center,” Cerny said. With construction already underway, “Phase one will be complete by November, before Thanksgiving, and the parking lot will be functional around December,” he said. The second phase accomplishes the same feat as the first, but in the opposite direction. 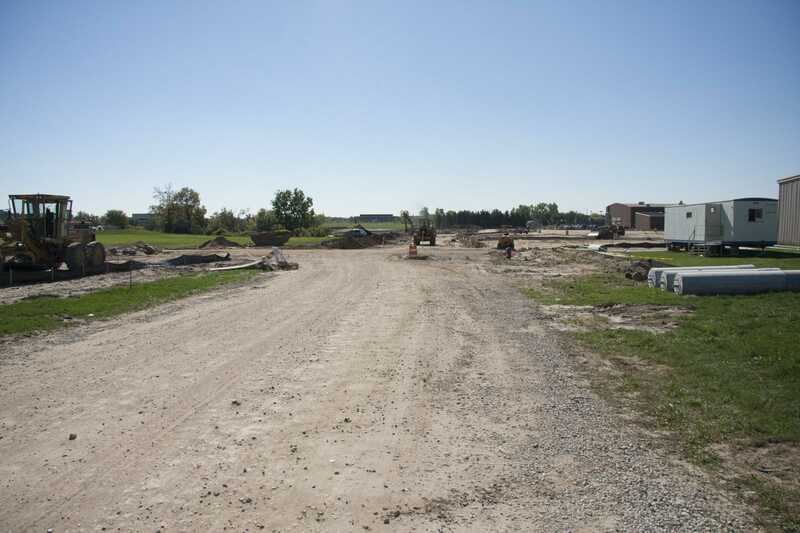 Mr. Cerny elaborates, “Phase two involves continuing the road from behind the back of the Physical Education building, through vacant land next to the soccer fields, to Six Mile Rd.” This step will take place after the first is complete, but the tentative dates are yet to be determined. The significance of the ring road is Schoolcraft will now be accessible by three major vectors (Haggerty, 6 Mile, and 7 Mile), instead of only Haggerty. Not only does this provide convenience, but also security. More spaces than that are already spread throughout Schoolcraft, so, this project aims specifically at putting spots where students need them. “Roughly… there will be 800-1000 new spaces by the time we’re done,” Cerny said. Overall, the road is another beneficial renovation for the college. It will bring more cars, convenience, safety, and even some beauty to the campus. Parking lot struggles will be minimized, winter walks to class less dismal, and pedestrians will be safe from speeders cutting through campus. By ensuring all of these rights and privileges to students, Schoolcraft is surely on the right road.